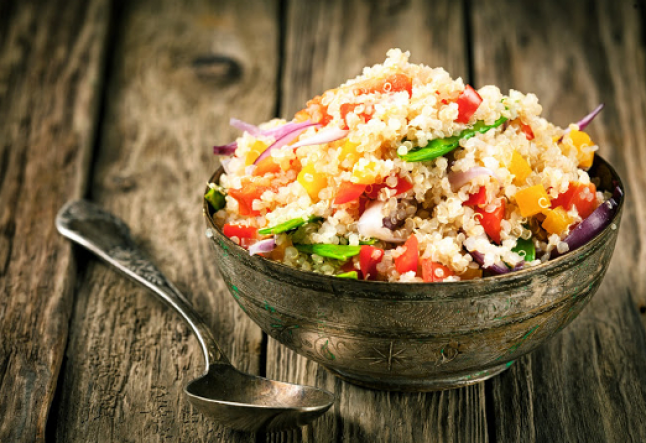 Quinoa is the amazing grain crop grown primarily for its edible seeds. Considered a pseudocereal rather than a true cereal, it is high in protein and fiber. Not only Quinoa is very versatile, it also tastes delicious and has a nice crunch if not overcooked. It is a great staple in your healthy kitchen, and easily replacing rice or pasta in many recipes. Mix all the ingredientes in a bowl. Serve with avocado and corn tostadas. You can serve this as an appetizer or a light lunch! Notes & tips: You can make this up to two days in advance. It will enhance the flavor!